This book argues convincingly against the widespread opinion that very few syntactic studies were carried out before the 1950s. 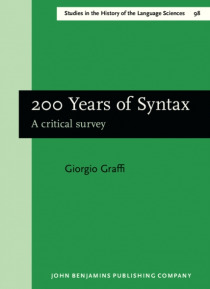 Relying on the detailed analysis of a large amount of original sources, it shows that syntactic matters were in fact carefully investigated throughout both the 19th century and during the first half of the 20th century. Moreover, it illustrates how the enormous developmen… t of syntactic research in the last fifty years has already condemned even several recent ideas and analyses to oblivion, and deeply influenced current research programs. The wealth of research undertaken over the last two centuries is presented here in a systematic way, taking as its starting point the relationship of syntax with psychology throughout this period. The critical ideas expressed in the text are based on a detailed illustration of the different syntactic models and analyses rather than on the polemics between the different schools.